06530 Saint Cézaire sur Siagne, France. Full Professor, Cell Biology, 1968-1981, Cornell Graduate School of Medical Science, New York, NY. Professor of Pathology, University of Toronto, 1981. In the Belgian Air Force Medical Corps, 1953-1955. Post-Doctoral Fellow, Sloan-Kettering Institute, .New York, NY, with Dr. C. Friend, 1956-1957. Guest Investigator, Rockefeller University, New York, NY, with Prof. G.E. Palade, 1962-1965. Director, Laboratory of Electron Microscopy, Department of Pathology (Banting Institute), University of Toronto, 1981 - 1983. Professor of Pathology, and Director of the Electron Microscope Laboratory, Department of Pathology, University of Toronto. 1962-1981 Cross appointment: Professor of Biology, Graduate School of Cornell University, New York, NY, US. 1956-1962 Assistant Professor in Pathology, Free University of Brussels, Brussels, Belgium. First Laureate of the "Rik and Nel Wouters Award for Cancer Research", presented by Queen Fabriola of Belgium, l969. 1957 Electron Microscope Society of America. 1957 New York Society of Electron Microscopists. 1957-1981 New York Academy of Sciences. 1958-1970 Association Française pour l'étude du Cancer. 1961-1975 Member of the Editorial Board 'Yearbook of Cancer'. 1964-1970 International Society for Cell Biology. 1966 American Society for Cell Biology. 1968 American Association of Cancer Research. 1968-1970 Secretary: New York Society of Electron Microscopists. 1969-1981 Course Co-ordinator: for 'Cell Biology', Cornell Graduate School of Medical Sciences, New York. 1970 American Society for Experimental Pathology. 1971-1981 Course Co-ordinator for 'Microscopy for Cancer Research' Cornell Graduate School of Medical Sciences, New York. 1974-l975 President, New York Society of Electron Microscopists. 1975-1976 President-Elect, Electron Microscopy Society of America. 1975-1978 American Society for Microbiology. 1976 President, Electron Microscopy Society of America. 1980-1981 The Society for the Study of Blood. 1981 Microscopical Society of Canada. 1985 International Academy of Pathology. 1961-1975 Member of the Editorial Board of "Year Book of Cancer". 1969-1977 Associate Editor of "Virology". 1970-1989 Associate Editor of "Cancer Research"
1987 Member of the Editorial Board of "Scanning Microscopy". 1987 Member of the Editorial Board of "Submicroscopic Cytology"
1989 Member of the Editorial Board of "Journal of Electron Microscopy Technique"
1977-1978 Chairman: Committee to review the First Year Curriculum Cornell Graduate School Medical Scences, New York. 1978-1980 Member : Senate Committee for Appointment and Promotions Sloan Kettering Institute, New York. 1982-1986 Chairman, Electron Microscopic Service Committee University of Toronto. 1985-1990 Member, Admission Committee, School of Graduate Studies (Pathology) University of Toronto. 1989 Member, Appointment and Promotions Committee, Department of Pathology, University of Toronto. "Electron microscopy of human leukemic cells", and "Cell surface morphology of human lymphocyte subsets identified by immunagold surface markers" supported by the Leukemia Research Fund. "Preclinical studies towards intravescial therapy of superficial bladder cancer". Supported by the National Cancer Institute of Canada, 1991-1994. Electron Microscopy of Normal and Malignant Cells, with Special Emphasis on Leukemia and Immunolabeling. 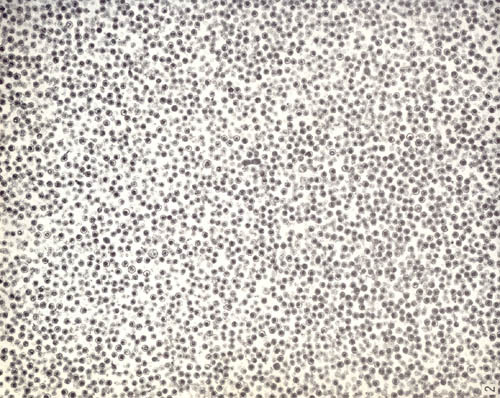 1985 MRC of Canada, for Project Grant, on Lymphocyte Ultrastructure, $55,000 p.a. for 3 year term. 1985 MRC of Canada, for Project Grant, on EM of Bladder Cancer $58,000 p.a. for 3 year term. 1988 National Cancer Institute of Canada, for EM of Bladder Cancer, $62,000 for 3 year term. National Cancer Institute of Canada, for "Preclinical studies towards intravesical therapy of supeficial bladder cancer" $60,000 / year, for a 3 year term. National Cancer Institute of Canada, Capital equipment award for the purchase of a new scanning electron microscope, $94,700. 1982 - Course Co-ordinator for "Biological Electron Microscopy" at School of Graduate Studies, University of Toronto. The course was given in 1990, 1988, 1986, 1984 and 1982. Clinical Fellowship and / or Graduate Students. All Residents in Anatomical Pathology at Toronto General Hospital, since 1982. Purified Friend Virus. The arrows show contaminants. 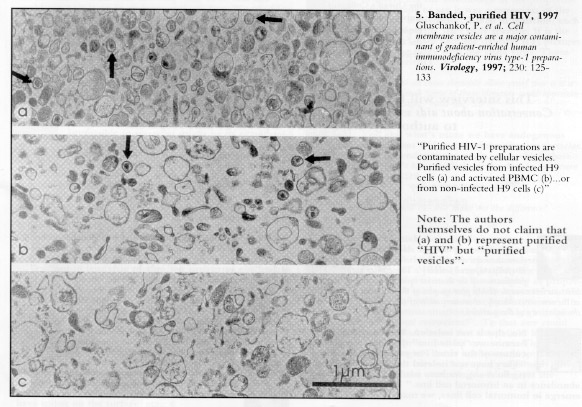 Contaminated "HIV". The arrows show supposed "HIV".